Successfully Added PDA Touchscreen Business Cellphone - QWERTY Keyboard + Dual SIM to your Shopping Cart. Touchscreen PDA cellphone with a built in QWERTY keyboard and two SIM card slots with business as well as fun applications. 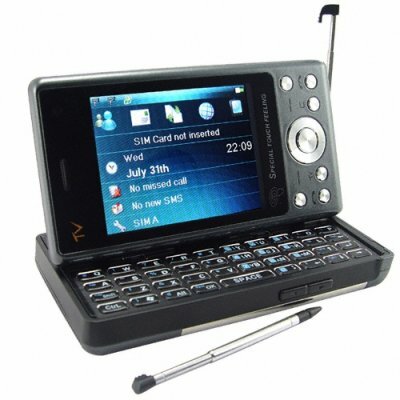 With a touchscreen that can be either in the closed "bar" position, as well as sliding up and out to reveal the QWERTY keyboard, this phone is easy to take out of your pocket to quickly answer calls and messages or use as a dedicated PDA with a full sized keyboard, additional navigation keys and a widescreen display for easy messaging and viewing media files. Businessmen will love the two SIM card slot feature, which will allow you to have quickly switch to 2 different mobile phone carriers without ever having to open the phone as well as the ability to send/receive SMS, MMS and even EMS (email) messages and internet access via WAP. The full-sized keyboard keys are so nicely spaced and the screen navigation menus so simple to use via touch or the keypad that you will wonder how you ever sent text messages before now. When not doing business, relax with MGPEG4 movies, MP3 music and even Super Nintendo and Nintendo games via emulated ROMs. Other key features include analog TV and FM radio reception, two built in digital camera/ digital video camera combo, and even an ebook reader. This 2.8 inch touchscreen mobile phone is proudly brought to you by Chinavasion Electronics. Order your stock now and don't forget to sell your customers additional add-on accessories like belt clip cases, protective sleeves and Bluetooth earpieces to maximize your profits. Unlocked phone; can be used with any carrier and SIM card(s). NOTE: This product is compatible with the worldwide standard GSM frequencies of 900MHz and 1800MHz. Please check with your network provider if you are unsure of your local GSM band. THIS PHONE WILL NOT WORK IN THE U.S., CANADA, MEXICO. What languages does the quad band dual SIM cellphone come in, I do not see ________ listed? The phone comes with a default selection of languages which are - English, Spanish, French, Farsi, Arabic, Thai, Vietnamese, Russian, Indonesian, Malaysian. If you need other languages and plan to order a large quantity (25+ pieces) then we may be able to supply it with the particular language you need. Is the PDA touchscreen business cellphone work on dual standby? This phone is dual SIM, but can only be operated on single standby mode. In single stand-by, do you can receive calls from any SIM, or in stand-by you can only get calls from one SIM?? "Dual SIM, single standby" means that the phone can only take (receive) calls on a single SIM card at one time. on 2010-01-02 23:14:12 Wow wow wow Chinavasion the best place for Value for money. I ordered this for myself and the Voyager one for my wife.The order was placed on the 21st and delivered on the 30th of December due to festive period here in the UK.Come on,I lack words to describe my feelings about this phone.It's great,stylish,attractive,calls for attention,with lots of functions.Chinavasion team you guys mark this down in your diary:"The day you close your business,you would have ruined some lives",so you are warned not to close down this business(I am very happy to deal with u again and again).Truly speaking you guys are true value for money business dealer.Thanks for the great quality products.Wifey and I will do business again with Chinavasion.Thanks a lot.Great customer care.We are happy. i like this phone very much, i think this is the bst phone in this series. It looks beautifull ,i'am charging it at the moment,can't wait to use it many thanks for the quick delivery.